Aboriginal (Indigenous) and multicultural issues are a significant part of everyday early childhood curriculum in Australia. When early childhood curriculum is inclusive, focused on diversity and difference, and politically engaged then social justice is possible. This book is the result of many experiences and conversations between the early childhood educators who have inscribed its pages with their yarns, stories and narratives. These examples of everyday practice show where they have struggled and at times succeeded in acting differently to tackle issues of social justice. The writers in this book follow in the footsteps of a number of early childhood activists who have enabled an ongoing conversation about social justice in everyday early childhood education. "Australia has always been a multicultural continent. At least 350 nations of Indigenous Australians have lived here 'since the beginning'"
This book is written by a diverse range of people and so it is suitable for a diverse audience. Each story in this book is written by an early childhood educator or early childhood activist including untrained, two-year TAFE trained, university qualified new graduates, and highly experienced early childhood educators. The stories in this book are not necessarily academic engagement with theories but instead a response to how early childhood educators used the work of researchers in practice. 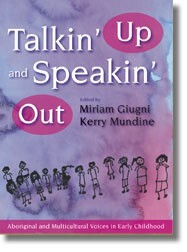 Talkin Up and Speakin Out: Activism and Politics in Early Childhood Education for Equity and Social Justice - Miriam Giugni.